Aim High. The United States Air Force slogan certainly fits the career of Louisville native Brigadier General Timothy A. Byers. General Byers graduated with distinction when he received his Bachelor of Science in Civil Engineering in 1981. As an undergraduate, he was the recipient of a Kentucky Transportation Cabinet scholarship and an AFROTC scholarship. He was later named an Air Force ROTC Distinguished Graduate. While on campus, he held leadership positions in student organizations including the American Society of Civil Engineering, Chi Epsilon civil engineering honor society, Phi Kappa Tau social fraternity and the Interfraternity Council. He was a member of Tau Beta Pi engineering honor society, Omicron Delta Kappa honorary fraternity, Lances Junior Honorary and Who’s Who Among Students in American Universities and Colleges. General Byers holds a master’s degree in engineering management from the Air Force Institute of Technology and is a graduate of the University of Virginia’s Darden School of Business Administration Executive Program and the University of North Carolina’s Executive Leadership Seminar. He is a Distinguished Graduate of the Air Force Squadron Officer School, an Academic Master of the Air Force Air Command and Staff College and a graduate of the Army War College. After graduation from UK, General Byers worked for Brighton Engineering in Chicago before being called to active duty at Wright-Patterson Air Force Base, Ohio in 1981. Since, he has led a successful military career, rising to the rank of Brigadier General. Of the nearly 330,000 active duty personnel in the Air Force, about 65,000 are commissioned officers. Less than one-half of one percent attain the rank of Brigadier General or higher. General Byers’ duties have encompassed planning, development, construction, maintenance, utilities and environmental quality for the Pacific Air Forces’ nine major bases, Air Combat Command’s 16 major bases and a multitude of smaller installations worldwide. In addition, he provided contract clearance, guidance and policy oversight to Air Combat Command’s non-construction contracting activities on more than $1.7 billion in annual contracts. General Byers is currently the director of installations and mission support, Headquarters Air Combat Command (ACC), Langley Air Force Base, Virginia. He leads ACC’s base and expeditionary combat support activities for more than 14,000 civil engineering, security forces and contracting personnel. He oversees the command’s Acquisition Management and Integration Center. In April 2009, General Byers learned he will be promoted to Major General pending Senate confirmation. 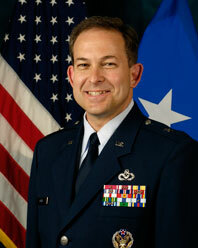 In addition, he has been named Air Force Civil Engineer, the highest-ranking civil engineer in the Air Force. He will be moving in June 2009 to assume those duties at the Pentagon. During his career, he has established and built multi-national partnerships with engineers in Korea, Germany and Japan. Additionally, he interacted regularly with senior Department of Defense officials, members of Congress, foreign dignitaries, senior military officers and state and local officials.